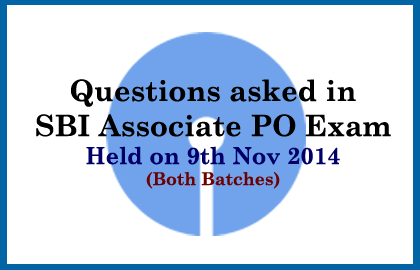 List of questions that asked in SBI Associate PO Exam 2014 dated 09/11/2014. Candidates those who are preparing for the IBPS PO/Clerk and all other banking exams can make use of it. World Rabis Day is observed on? Which is the regulatory body of RRB? Who is the author of the book”God of small things”? Which of the body regulates the mutual funds in India? On which basis, Interest on savings bank account are paying? Who won the Nobel prize for peace 2014? MMID has linked with which of the following? Who among the following is not a Tennis Player? By which materials currency notes are made? What meant by PING in computer networking utility? Who is the present Water Resources Minister? What is the upper limit for PPF? Match the wrong country and capital? Name the footballer who was suspended for the biting italian paler in FIFA 2014? Which American activist uses the the slogan“I Have a dream” in public speech? Who is the author of the book“Final Test: Exit Sachin Tendulkar”? Which is the regulatory body for insurance? Which is the oldest currency in the world? What is the result of inflation?